Dr. Norgrove Penny with children in Uganda. Who inspired Jane to put a legacy gift to cbm in her Will? 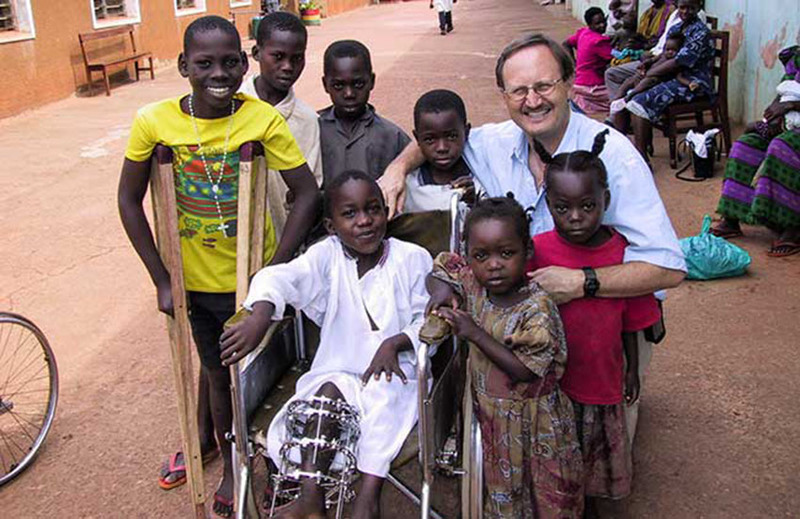 Who inspired Dr. Norgrove Penny to serve as an orthopaedic surgeon with cbm in Africa? At the peak of his career, Dr. Norgrove Penny left his thriving Victoria practice to work with cbm in Uganda. When asked why, he replies, “I am a follower of Jesus – that is, He is my role model… Most of the time, He was healing people with chronic disabilities: people who were deaf, blind, lame or had leprosy or epilepsy. After six years in Uganda, Norgrove returned to Victoria and began a new orthopaedic program at Queen Alexandra Centre for Children’s Health. He continues to practice there today. Dr. Norgrove Penny (with his wife Anné) was recognized with the Order of Canada – for establishing a program of specialist surgical and rehabilitation services to Ugandan children living with disabling physical impairments such as clubfoot and polio. His project established a successful children’s hospital and a treatment program for babies with congenital clubfoot deformity that has become a world model. Like Jane, you could be an inspiration for future generations by including a gift in your Will. You could bring help and hope to children and families caught in the cycle of poverty and disability. Only God knows the impact your legacy will have in the lives of people… forgotten by others. Click here for information about leaving a legacy gift in your Will.